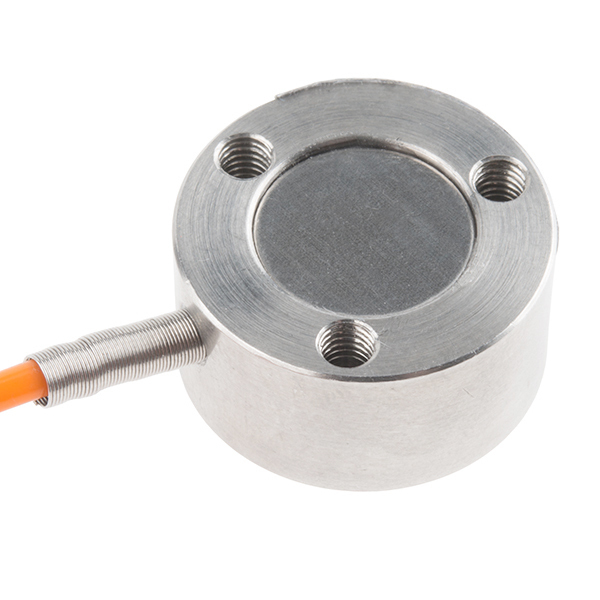 This single disc load cell (sometimes called a strain gauge) can translate up to 50kg of pressure (force) into an electrical signal. Each load cell is able to measure the electrical resistance that changes in response to, and proportional of, the strain (e.g. pressure or force) applied to the disc. With this gauge you will be able to tell just how heavy an object is, if an object's weight changes over time, or if you simply need to sense the presence of an object by measuring strain or load applied to a surface. Disc load cells are a bit easier to mount than bar-style load cells, making them more straightforward to implement into a design. Each load cell is made from an steel-alloy and is capable of reading a capacity of 50kg. These load cells have four strain gauges that are hooked up in a wheatstone bridge formation. The color code on the wiring is as follows: red = E+, green = O+, black = E-, and white = O-. 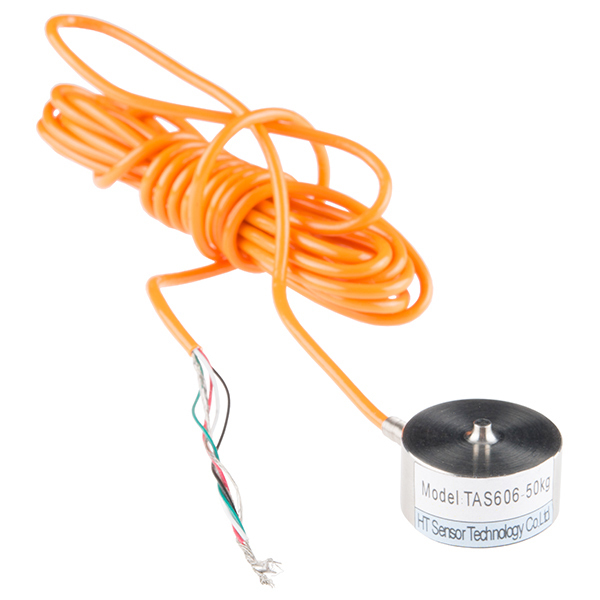 Additionally, these load cells offer an IP66 protection rating. I have a pre-purchase question: Is the 50kg limit distributed across the four cells, or is it a cumulative max. of 50kg? I'd like to build a platform scale to measure liquid volume in a 30-gallon stainless steel kettle. Ideally, I'd like to have +/- 1-quart accuracy. So, a 20lb vessel with 240lb of water in it is about 260lb, or roughly 109kg. In other words, is it reasonable to expect a platform with four 50kg-rated load cells to perform under an expected load of 109kg? does it affects the weight result if I attach a magnet on it ? Sigh, no matter how hard you try you still end up with typos... Fixed. 2 km of four strand wire for $57?! Screw the load cell! I'll take two! What is the milivolt to force equation for this cell? If I use this cell with the amp board, can I read the data using a voltmeter? Why not use a full-bridge for your Wheatstone bridge? This is designed to mitigate the error that comes up with temperature change. What is the resolution? I do a lot of baking and need at least 1 gram resolution. I've been wanting to make my own scale for quite some time. to get 1g accuracy you need 1/50000 of the full scale which is 0.002%. Looking at the datasheet the combined error (accuracy) of this load cell is +/-0.05% So you would struggle to get accurate and repeatable results with such a high range load cell. 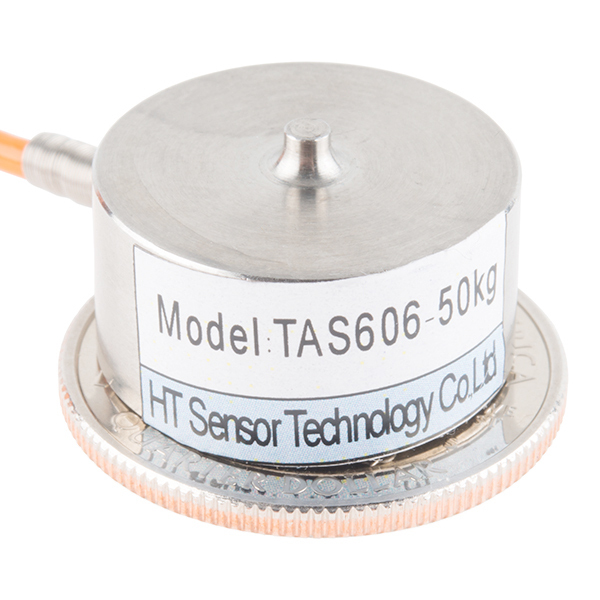 Try looking for something a bit smaller, a 5kg load cell of the same brand would be a lot more accurate. Thanks for the reply! That was the information I was looking for. Now that I know, it seems obvious, but before I was struggling to understand load cell ratings. I ended up buying the load cell from another company. What I find odd is that Sparkfun's load cell selection is for large load load cells. It is almost like they have fallen victim to the "bigger is better" mentality. There isn't, or at least wasn't (I haven't checked again), a single small load cell among the selection. Large load cells have their place, but I suspect that most hobbyists would rather have the smaller cells.